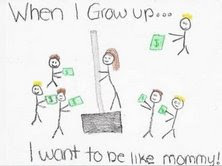 I want to be very clear on my child's illustration. It is NOT of me on a dance pole on a stage in a strip joint. I work at Home Depot and had commented to my daughter how much money we made in the recent snowstorm. This photo is of me selling a shovel!!!!! Thank you for sharing this. It made me laugh out loud!